Taylor Kissinger scored 18 points and the Nebraska defense kept the USA Today No. 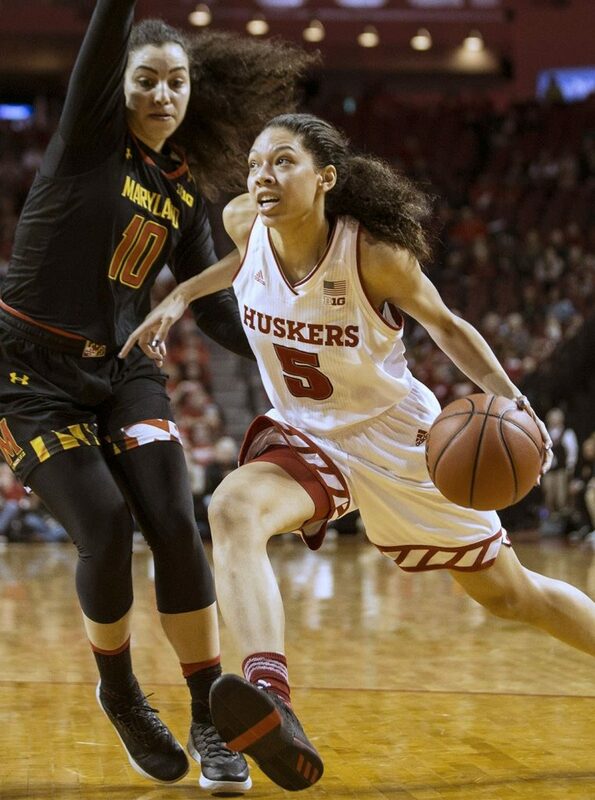 10 Maryland women’s basketball team within striking distance, but the Terrapins prevailed 64-57 at Pinnacle Bank Arena on Sunday afternoon. Maryland sophomore Kaila Charles helped the Terps improve to 20-3 overall and 9-1 in the Big Ten by scoring 25 points on 11-of-16 shooting while adding a game-high 16 rebounds. The Terrapins have won 18 of their last 19 games. Kissinger, a freshman guard for the Huskers, answered with 18 points on 6-of-10 shooting, including 4-of-8 threes, in 27 minutes off the bench for the Big Red. Nebraska slipped to 17-7 overall and 8-3 in the Big Ten, as the Huskers had their five-game winning streak snapped. The loss marked the closest game in the series with the perennial power and three-time defending Big Ten champion Terrapins. It was the first time the Huskers have played Maryland within single digits in seven all-time meetings. Last year, the Huskers lost to Maryland by 44 points in Lincoln. In a game that was close throughout, Maryland built its biggest lead to 12 points in the fourth quarter, but Nebraska rallied to trim the margin to just two possessions on four occasions in the fourth quarter. Kissinger’s last three-pointer of the game with 59 seconds left cut the Maryland edge to 59-54, but the Big Red could get no closer in the final minute. Fellow freshman Kate Cain added eight points, nine rebounds and three blocked shots to help the Huskers inside. Cain’s three blocks pushed her season total to 79 to establish a new Nebraska single-season record, surpassing Olympic bronze medalist Danielle Page’s previous mark of 78 (2007-08). Sophomore point guard Hannah Whitish added seven points, four rebounds and four assists, as Charles took the primary responsibility in holding Nebraska’s leading scorer in check. Senior guard Jasmine Cincore added seven points of her own, while Nicea Eliely, Maddie Simon and Bria Stallworth each contributed five points for the Huskers. The Huskers hit just 35.6 percent (21-59) of their shots for the game, including 7-of-20 three-pointers (.350). NU went 4-for-8 from long range in the fourth quarter. Nebraska hit 8-of-14 free throws and won the turnover battle, 17-9. The Huskers outscored Maryland 15-7 in points off turnovers in the game, 8-4 on fast breaks and 25-14 off the bench. Led by 16 rebounds from Charles and 10 from senior guard Kristen Confroy, Maryland produced a decisive 49-29 edge on the boards. Maryland turned 18 offensive rebounds into 13 second-chance points, while the Huskers managed just seven second-chance points on nine offensive boards. Maryland was plus-16 on the glass in the second half, but Nebraska won the second-half turnover contest, 7-1. The Huskers held one of the nation’s best offenses to just 39.7 percent (23-58) shooting for the game, including 33.3 percent (4-12) from three-point range. The Terps knocked down 14-of-23 free throws (.609) in the game, including 8-of-14 in the fourth quarter. Brianna Fraser was big for Maryland in the second half, scoring 12 of her 14 points in 11 second-half minutes off the bench. Point guard Channise Lewis added nine points and six assists for the Terps on the day. In a low-scoring first half dominated by a pair of aggressive defenses, Nebraska trailed 27-22 but took momentum to the halftime locker room. Maryland build its biggest lead of the first half at 24-14 after a steal and layup by Lewis with 3:44 left. But the Huskers answered with an 8-0 run in the next three minutes that included five straight points from Kissinger, a free throw by Cincore and a layup by Darrien Washington to cut the Terp lead to 24-22 with 1:17 left. Lewis then hit a three-pointer with 41 seconds left with one on the shot clock to push the margin back to five heading to the half. Lewis scored the last five points for the Terps in the half after Charles scored Maryland’s first eight points of the second quarter to account for the 13 points by Maryland in the period. Kissinger (7), Cincore (3) and Washington (2) accounted for Nebraska’s 12 points in the quarter. Kissinger led the Huskers with 10 first-half points, including both of Nebraska’s threes. The Huskers hit just 33.3 percent (9-27) of their first-half shots, including just 2-of-8 threes, and just 2-of-6 free throws. Maryland hit 40.7 percent (11-27) of its shots, including 2-of-7 threes, and 3-of-6 free throws. The Terps won the first-half rebounding battle, 20-16, but the Huskers won the turnover battle, 10-8. Charles led Maryland with 14 points, while Eleanna Christinaki added six points. The Huskers will enjoy the midweek off before completing their three-game home stand by playing host to Wisconsin on Sunday, Feb. 11. Tip-off between the Big Red and the Badgers is set for 2 p.m., with a pink out planned for Play4Kay Day. Tickets are available now at Huskers.com.